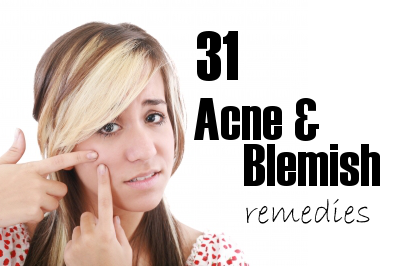 I’ve been battling acne since my early teens. I’ve tried just about every medication known to man and while most of them did the job they also did a job on my wallet. When our oldest son started getting breakouts I thought there must be a cheaper way to treat our acne. With a little research I found that the best acne treatments could be found in our kitchen. To reduce inflammation, gently dab with Witch Hazel. Can be used daily to control breakouts. To control, wash affected daily with borax, rinse well. To clear small breakouts, dab area with a cotton ball dipped in hot salt water. To clear up and reduce outbreaks, scrub face with a mixture of salt and olive oil. To clear up skin, dab area with a cotton ball dipped in hydrogen peroxide. To treat, mix 1 teaspoon ground cinnamon with 3 tablespoons of honey, apply to the skin before bed. Wash with warm water. To banish blackheads, mix equal parts oatmeal and ground cinnamon , add water to make a thick paste. Scrub face with the mixture and rinse with cold water. To control, dab affected area with undiluted lemon juice. To stop breakouts, apply a facial mask to your entire face made from 1 teaspoon of ground cloves, 1 teaspoon of honey and 3 drops of lemon juice. Allow the mixture to remain on your face for 20 minutes and then rinse with cold water. To clear up, cut a clove of garlic in half and rub it over the area. To eliminate, wash your face with a mixture of crushed onion and water. To control, wash your face with a little honey and warm water. To treat, add a couple of crushed egg shells to a cup of apple cider vinegar. Let it sit for a few days and then apply the mixture to affected area. To control, spread cooled, cooked oatmeal on your face and leave it on for about 15 minutes and rinse. To reduce swelling, mix equal parts flour and honey, apply to the infected area before going to bed and cover with a bandage. To control, rub the area with a cut, raw potato and allow it to remain on the area for 3-5 minutes before rinsing. To remove blackheads, apply a cooked potato that has been mashed, to your face. Allow it to remain on your face for 30 minutes before rinsing. To reduce blemishes, scrub the area with a mixture of mashed potatoes and lemon juice. Allow the mixture to remain on the area for 15-20 minutes before rinsing. To remove whiteheads, apply a cooked potato that has been mashed, to your face. Allow it to remain on your face for 30 minutes before rinsing. To control, clean skin with a paste made from turmeric and honey. To treat, rub your face with the inside part of a banana peel before bed. In the morning rinse your face. Repeat for one week. To control, rub the area with a thin slice of fresh ginger. To control blemishes, apply ginger juice to the affected area. To treat, apply aloe vera gel to the affected area. To treat blackheads, apply aloe vera gel to the affected area. To treat whiteheads, apply aloe vera gel to the affected area. To treat, dab a little toothpaste to the affected area before bed. Wipe away in the morning. To control, use a rosewater toner. Make your own by mixing together 1 ¼ cup rosewater and ¾ cup witch hazel. Store in a dark colored jar. Use daily by applying to your face using a cotton ball. To lighten blackheads, mix 2 parts rosewater with 1 part lemon juice. Apply to skin twice a week. To control, rub green tea leaves on your face after cleansing. What do you use to treat acne and blemishes? This post may contain affiliate links, so please take a moment and read our disclosure policy.